In tradition of the Scary Movie franchise, Superhero the Movie takes the "Mickey" out of the current influx of Super Hero movies, especially Spider-man. The story revolves around Ricky Riker (Drake Bell), a teenager who eventually becomes a superhero after being bitten by a dragonfly. 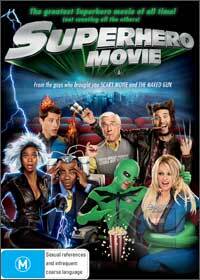 Of course, it's up to Ricky to save the world, get the girl and get laid in this classic spoof movie. The humour of Superhero the Movie is quite crude at times and without spoiling what are some of the genuinely funny parts of the film, I can say that the first half of this film was entertaining and actually funny but it started to lose me when the running gag, not very funny the first ten times, continued to plague my senses and the hero’s life. Definitely one for those who enjoyed Meet the Spartans or the Scary Movie franchise and if that's not enough, you might want to check the alternative ending and deleted scenes for a few extra laughs.